The name Fiona Oakes will be familiar to many in the vegan community. She's equal parts force of (and for) nature and inspiration. We caught up with the extreme distance runner last week, between her jaw-dropping training sessions and long, long days looking after over 450 animals at her sanctuary – Tower Hill Stables. You've been vegan for a long time, how does it compare now with when you began your vegan journey? The comparisons between when I went vegan and now are really and truly off the scale in difference. There were simply no dedicated vegan options back in the early 1970s in a small town in Derbyshire. If you wanted plant-based milk you had to travel to a city to find it and then it was a powder you had to make up. The only way to be vegan was to devise your own recipes and solutions and this is something my Mum became very good at as I was only six years old at the time. Do you have a special dietary regime – such as high carb or high protein – or do you get to eat whatever you like? What kind of things might we expect to see on your dinner plate? Do you supplement? Any advice for folks looking to eat healthily? The truth is certainly not conventional, but it is my truth and the only one I feel comfortable sharing. I am really and truly grass roots and honest about my veganism. I take no supplements and never have. I rely on fortified food such as Vegemite for B12 and a balanced, basic diet. I eat only one meal a day and don't snack – that meal being in the evening. It's pretty basic and made up of what is available, seasonal and inexpensive. Whole grains, nuts, pulses, rice, pasta, fruit, vegetables and bread play a large part in my diet. I like peanut butter, Vegemite and marzipan when I fancy something sweet for desert. I don't really do juices or smoothies as I don't have the money or time for that in my daily routine – my day starts at 3.30 in the morning with either training or starting to feed the animals. When did you start running and why? Had you tried other sporting activities before settling on long distance running? What motivates you? Do you ever team up with other vegan athletes? Before I ran I was a cyclist but this ended when we moved to the Sanctuary in 1996 as I found it too time consuming to be competitive with all the training involved and the hours you need to spend on the bike. It's also quite expensive as you need a lot of equipment. I couldn't bear the thought of not doing anything though and I hit on the idea of jogging to start with. Then that quickly ramped up a gear to running and the rest is history! I guess when I had discovered that I could actually run it coincided with the time that Paula Radcliffe was doing well in the marathon and I thought that if I too could do relatively well at this distance – this is back in 2002 when just completing a marathon was considered an achievement – it would be proof positive that being long term plant-based is in no way prohibitive to achievement even in, what was considered at the time, the toughest endurance event in the athletic calendar. As for hooking up with other vegan runners, I would love to do this more. When we started the Club back in 2004 there was only a handful of us and we were running for the VC&AC, but when I started gaining qualifying times for the elite starts of the world's major marathons we decided it was the time to grab the opportunity for promoting veganism in a sporting forum and affiliate a vegan running club rather than continue to promote a vegetarian one. Tell us a little about your training regime. Does this intensify before a planned event? Who is on Team Fiona when you're racing? Do you have a personal trainer? How did you arrive at what works best for you? Team Fiona is pretty much Fiona and Percy Bear (my long time companion and Sanctuary mascot). When I started achieving decent results I did look for a trainer and there was some interest but the 'deal breaker' was my veganism and the reluctance of sporting 'experts' to take it on board. The basic deal with them was 'ditch the vegan diet or we will ditch you.' My diet is my life, the reason I live and it's not up for debate so I basically went away and figured out what you have to do to run a decent race. Trial and error – lots of both – feature heavily in my running. I have no coach, no physio and have never even had a massage. I do it all on a totally and utterly amateur basis – preferring not to spend any money on my sport as I need it all for the animals I am trying to help by doing it. I will say that when I train I train hard. I have a million and one other things I could be doing so if I am not doing it 100 percent it's just not worth it. Nine sessions a week including three doubles and three speed sessions, hills, long run of both on and off road. 'Go hard or go home' is pretty much my mantra, the logic being if you don't train hard you won't race hard. Recently I heard Eliud Kipchoge say that and if it comes from him it has to make sense! I don't know whether my methods would work for other people in a 'get fit with Fiona' type workplace but it certainly has – and continues – to work really well for me. I think the one thing which helps me enormously is I find self motivation no problem. I went vegan when I was six-years old – totally self inspired – and this is pretty much how I live my life, on my terms for the animals. If I think I can get an ounce of anything out of a situation or scenario to their benefit then I will roll with it, if not I move on. You hold a number of World Records, what do you consider your greatest sporting achievement? Several and rather diverse. A personal best of 2 hours 38 in the marathon has got to be high on the list, winning the North Pole and Antarctic Marathons in such style, three completions of Marathon des Sables and the first vegan lady to do so (even though I had two broken toes) has to come high up there too. But just being able to keep sustaining the training to keep producing the results proving categorically that long term plant-based life is not just an adequate form of fueling yourself but a superior one. The results on the day are just a testament to the amount of training your body has been able to maintain and sustain over the years without injury or illness and plants facilitate this in spectacular style. You've done all of this despite the missing kneecap, can you tell us a bit about that, how you've managed to keep running and what measures you need take to make sure you don't suffer any injuries or further damage? So my kneecap was removed as I said earlier after multiple surgeries to correct a growth defect. It was very tough at the time but something I try not to dwell on. The famous saying is that you never want to go to the start line of a race knowing you are carrying an injury – I never go to the start line of a race knowing I am not. This is pretty much why I tended to stick to road running at the start of my running career. Major city races, elite starts so I could be at the front, invitations to events which would minimize expense and only two 'full on' efforts a year which would facilitate me being away from the Sanctuary for the least amount of time. 26.2 miles on straight, flat tarmac was all I thought my knee would hold up to. It was only later when I decided I had done pretty much all I could with my road running – Top 20s in London, Berlin, Great North Run and places in Amsterdam, Florence, Moscow, Rio etc. – that I decided to widen my running 'net' and look for other options. Last year was frantic. We managed to acquire our new Sanctuary site – Gracedale Farm – a dream come true. A haven for many animals both now and in the future, it has meant we can expand our work and rescue more animals. That has to be the high of not only 2018 but my life – for me caring for the vulnerable voiceless souls on this earth is what I myself live for. I seek nothing else but to be able to help them in some way and impact their future in a positive fashion. A Group and Stage win in the Atacama Crossing wearing my new signature Will's Shoes. They were absolutely amazing and didn't fall to pieces and it was much rougher terrain than Marathon des Sables. Starting at over 13,500 and descending to around 10,000 feet, we had just about everything in that race. Ice, sand, dunes, rocks, salt flats and water crossing and I came away both successful and unblemished – as did my shoes. Will's Shoes kindly donates 30 percent of the price of each pair sold to the Sanctuary so it's a really great result for both the animals, your running and promoting veganism as they are entirely – and possibly uniquely – the only running shoe to tick all those boxes. Animals are still dying so I have no right to feel anything but the desire to try and stop this happening. Perhaps if, one day, the world wakes up to the devastation humans are causing to the animals, the environment and each other then I can sit back and think I played some very small part in making that happen but for now, it's full steam ahead with the Sanctuary and my running and promotion of all that I believe. So my memories of the grueling race that is Marathon des Sables serves me very well in every day life. When you have competed in it and, hopefully, completed it you tend to take nothing for granted. You turn on the tap and water comes out - as much water as you can drink. What a blessing as you remember experiencing 'water depredation and fear' in the desert. You are not hungry, you have a bed to sleep in, don't have to carry a huge backpack around with you and strain under the weight of it whilst being baked in the intense and unforgiving Saharan heat. It's just one big reality check, but the biggest and most humbling reality is that you are able to even consider doing it. The blessing that is the fitness and fortitude to be able to go there and try is amazing. To this end I am going back for the fourth time this year to try and run without broken toes, broken shoes or a broken tent mate for company. I just want to 'hit it hard' and run for Fiona and the animals. 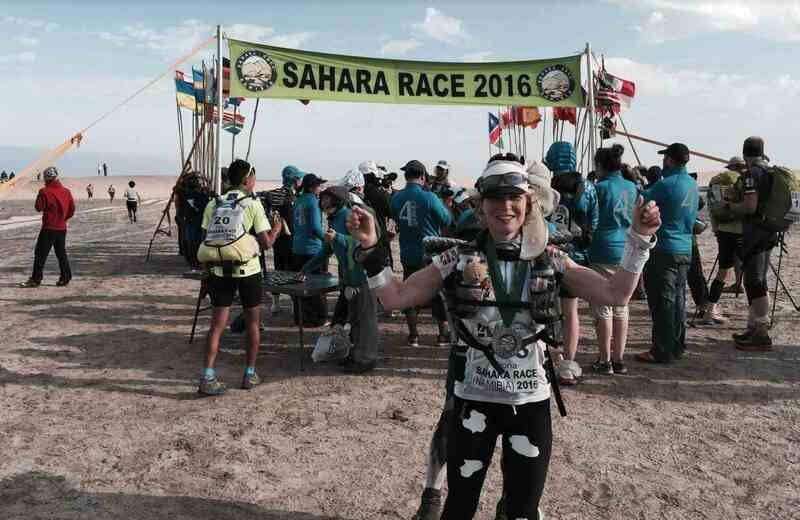 Then when I return I have a Championship Start in the London Marathon but it's just two weeks after Marathon des Sables so I intend to go this Start in my cow outfit with my Vegan Runner vest on top. In addition to daily training, you also run Tower Hill. Talk us through a typical Fiona Oakes day. Tell us about the sanctuary, the residents and how PBN readers can help. I like to work a 'top heavy' day so I get up early to make sure I can have plenty of time during the day if problems occur. During the winter I will probably train first thing for a couple of hours with my head torch as the animals prefer to work to daylight hours. It changes in the summer with the longer days. Currently, we have around 450 animals to care for including 86 horses, 121 pigs, 100 sheep, 32 cows, 13 dogs, 12 goats, 18 cats and many, many birds including geese, turkeys, chickens, cockerels, ducks, peacocks and swans. The running logistics are huge as is the workload and worry of financing it all. We started off self-funded back in 1996 when we founded the Sanctuary, but since people have seen what we are trying to do they have kindly asked if they can help. We take nothing financially from the Sanctuary and still put all our own money into it. Parents' pensions, money from working as a retained Fire Fighter and my partner's salary are what has formed the main financial body of making this happen for the animals. If people would like to help that would be great they can go to our website or you can visit us on our Facebook page or the Instagram handle is @towerhillstables. What's the Fiona Oakes Foundation and what's happening with that? The Fiona Oakes Foundation was started to try and help promote veganism specifically – but not exclusively – in a sporting forum. We give small grants to young people hoping to make a future in their sporting discipline and use it to promote veganism, we also try to sponsor events where veganism can take a main stage. It's something I would like to try and grow in 2019 and am hoping the film will enable me to make this happen. The Fiona Oakes Foundation is basically about 'spreading the word' to all and any who will listen and by being a presence for all to see. Anyone who wants to support my outreach program can support me by becoming a Patron on my Patreon Page. You're a patron of Freedom for Animals (formerly the Captive Animals Protection Society), any other groups/campaigns you lend your name and support to? I am indeed a proud Patron of Freedom for Animals, an Honorary Patron of The Vegan Society, Founder member of VITA the animals rights group in Russia, Honorary Member of Vegan Runners and spokesperson and Patron of Omskiye Khvostiki – a dog shelter in Siberia. Where do you see veganism in five years time? 10 years? Thanks so much for taking the time to talk with us, any closing thoughts? My answers are not always pretty, not dressed up in frills, don't fit the conventional stereotypes of what people think my life will be like but it's the truth. I don't have a 'before and after' vegan Fiona to peddle around the internet accompanied by false and staged photographs. There has never been a Fiona who is any different to the one you see right now, who knew it was wrong to be party to the harm of any creature when I was very, very young I made the connection – for that I don't seek praise, I believe I am blessed. The key words in my life are dedication, discipline, denial, determination, decency and delivering these in my actions to hopefully benefit the animals. I don't want to get into massive arguments which take precious energy and divert attention from the real job in hand. I don't want to analyze my diet to within an inch of its life. Personally, I don't care what I have to do to myself to get where I need to be in my journey to help those who have so few friends. My epitaph, if I had one, would be – she got the job done!